ENTRIES have closed well in advance of the deadline for this Sunday’s Chichester Priory 10k. A 10am start in College Lane will see around 1,500 runners line up to tackle the testing course in the event’s 24th year. It has become one of the major road races in the English road-running calendar. Runners from all over England will be competing. As part of the Sussex Grand Prix series, the race will see entries from Arena 80, Arunners, Hailsham Harriers, Haywards Heath Harriers, Horsham Joggers and Lewes AC, among others. 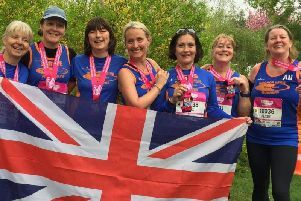 Chichester Runners and Tone Zone from Bognor will have their usual excellent turn-out and the event’s inclusion in the Harvey Curtiss Road Race Challenge should see a good representation of top Sussex athletes. Also taking part will be a number of athletes from well-known clubs as Aldershot, Farnham & District AC, Blackheath & Bromley Harriers, Brighton & Hove AC, Brighton Pheonix, Bristol & West AC, Southend AC, Cardiff AC, Winchester AC, Herne Hill Harriers, Kent AC and Southampton AC. Are you running in the Chi 10k? Look out for our man filming all the starters and some of the finishers. We’ll have video, pictures and reports on this website from Sunday afternoon and full coverage in next week’s (Feb 12) Observer series, including a full list of finishers and their times. There is a comprehensive prize list. A special prize is available again this year for the male and female runners who break the course records – 29.02 for men and 32.07 for women. There are three special prizes for local runners: the Chichester Observer will again sponsor the Ben Steppel Memorial Prize to the first under-23 local man home and the organisers will be presenting the Colin Thorne Memorial Prize to the first under-23 local woman finisher. A new prize was introduced in 2014 in memory of Henry Adams, a former race director and stalwart supporter of the race since its inception, who died in 2013. This is to continue in 2015 and will be given to any runner who has a special story or a memorable reason for running. It is fitting that Henry’s son David is running again this year. The Chichester event and particularly the fast, flat course lends itself to an exciting race. This year there are a number of male runners who have hit or are capable of or hitting the magical 30-minute mark, which will make once again for a very fast and competitive race. Many have very high rankings in the UKA list for the 10k distance, many of which were achieved at Chichester last year. Set to spearhead the field will be the first three runners home in the 2014 race. Last year’s winner Phil Wylie of Bristol and West AC is looking to retain his title. Runner-up Jon Pepper of Brighton Pheonix should give him a run for his money, as should last year’s third-placed runner, Paul Whittaker of Southend. However, the man to look out for is Alex Bruce-Littlewood of Blackheath & Bromley Harriers, who competed mainly in the USA in 2013 and was fifth in the BUPA London 10k last year. He was fourth in the recent SEAA cross-country championships at Brighton behind Pepper, so the rivalry between them will continue here. Others ranked nationally include Peter Huck of Run Fast, Kevin Rojas of Brighton & Hove AC, Alex Wall-Clarke of Southampton AC, Paolo Natali, Chris Busaileh, Andy Greenleaf of Winchester & District, Paul Rodgers of Aldershot, Farnham & District and Will Green of Serpentine RC. Chichester Runners are well-represented with Harry Leleu or Peter Concannon likely to take their first place. The women’s race again is looking to be of a very high standard with plenty of contenders for the medals – including the first three runners form the 2014 race. Back to defend her title and perhaps break the course record is last year’s winner, Charlotte Purdue from Aldershot, Farnham & District, a former junior European champion at cross-country. Runner-up last year Jess Andrews, a team-mate of Purdue, is back as is third-placed Ava Hutchinson of Cardiff AC. Also returning is previous winner Caroline Hoyte of Arena 80 AC, with other well-ranked runners. Rebecca Moore and Emma McCready of Worthing Harriers (third in the SEAA cross-country at Brighton), Kathy Bailey of Winchester (another previous winner), Helena Tobin (Brighton & Hove) and Rosie Hiles (Chichester Runners) should all feature in the top ten. Rebecca Moore is one of the areas’s leading road-runners taking the bronze medal in the Great South at Portsmouth back in October. A number of these female athletes will also feature among the veteran prizewinners as well. The leading women’s teams in contention for the podium with their wealth of running talent look to be Arena 80, Worthing Harriers and Chichester Runners. The men’s race appears far more open with strong competition from a number of Sussex and Hampshire clubs and those farther afield, all of whic have a good chance of taking one of the prizes. It is organised by the Rotary Club of Chichester Priory, who will have 170 marshals and stewards helping the runners to complete the course. The race is fortunate, for the ninth year running, to have as a major sponsor Brooks, the international sports equipment company, who are joined by new major sponsors John Brown Associates, the firm of local architects. Supporting sponsors for 2015 are two local firms – solicitors Wannops and estate agents Henry Adams. Organisers are wishing all participants an enjoyable and successful run. They are hoping for similar dry and at-times sunny conditions to last year but without the wind. Spectators are welcome along the route to cheer on the runners.